Note: for this popup I asked my good friend Mitch Davis to act as sous-chef and guest bartender. 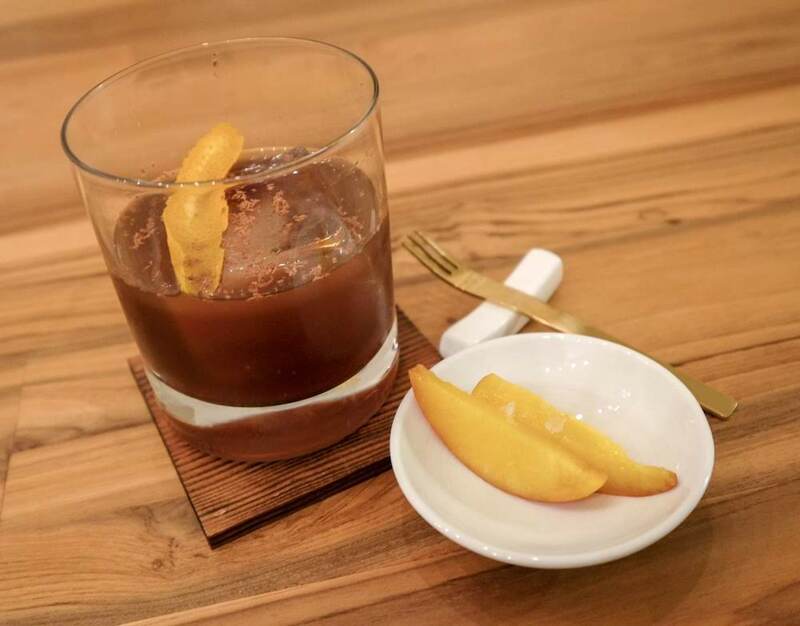 This is the third of three cocktails he developed for this menu, and the rest of this post is written by him. For the final drink, it seemed only appropriate to combine my favorite cocktail (Old Fashioned's) with my favorite digestif (espresso). Adding chocolate flavors and a orange express were just natural extensions. For 4 servings (you will have extra bourbon). Prepare the espresso-infused bourbon (up to 1w in advance): Combine the bourbon and espresso. Infuse at room temperature for 1h, then strain through a fine-mesh strainer lined with cheesecloth. Prepare the demerara syrup (up to 3d in advance): Combine the demerara sugar and water in a pot and bring to a simmer; stir to dissolve the sugar. Simmer until thickened, remove from the heat and cool. Chill until needed. To serve: Add Demerara syrup, allspice dram, bitters, and bourbon to stirring glass. Add ice and stir for 15 seconds. Strain into Old Fashioned glass over large ice cube. Garnish with orange express and grated chocolate.